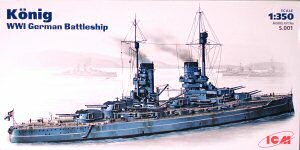 The battleship König (pronounced Kyonig - translated means "King") was the first-in-class for a new generation of battleships. The König class was the first of the German battleship designs to mount her main guns along the centerline and she was able to bring all ten of her guns to bear in a broadside engagement. The König and her three sister ships all participated in the Battle of Jutland, the largest naval battle of World War One and the largest battleship clash in history. The König was damaged in that battle being hit by four 15 inch rounds and a number of smaller gun rounds, killing 45 and injuring another 27 of her crew. König was repaired and took part in the naval battle in the Baltic sinking the Russian battleship Slava. König survived the war only to be scuttled by her crew during its internment in the Scapa Flow in 1919. König still sits on the bottom of the Scapa Flow. 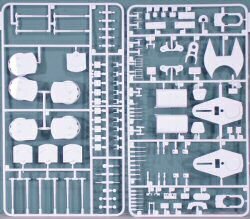 ICM has re-released their 1/350 König class battleships and while I missed them the first time around, I am impressed with the kit. 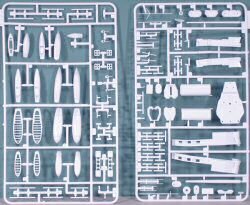 Molded in white styrene, the kit includes a one-piece hull, main and focsl decks, and nine parts trees. Assembly begins with the main gun turrets. Each of the 12 inch guns can be moved in elevation independently (if you choose) and each of the five turrets can be built to rotate. Next, the three propellers and two rudders are installed and the main hull is mounted to the display base. The main and focsl decks are installed onto the hull along with the five main and 14 secondary 5.9" inch gun turrets. The superstructure, main stacks, masts, launches, life boats, and other deck gear are installed in logical increments to make painting and assembly easier. 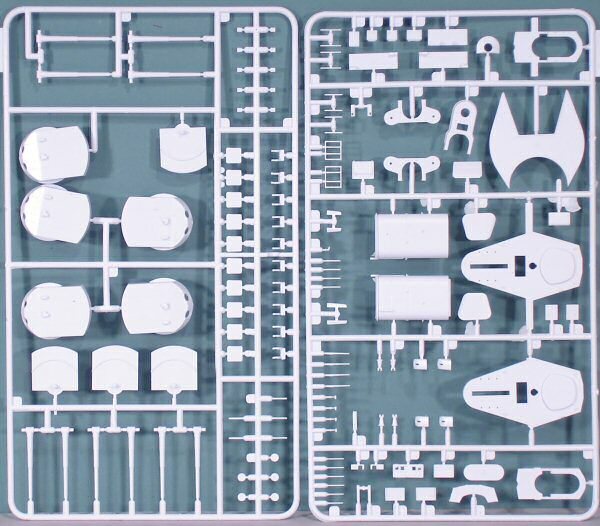 The instruction sheet is very nicely laid out clearly showing placement of all of those parts. The centerfold of the instruction booklet has a nice painting diagram using Humbrol paint numbers for color reference. 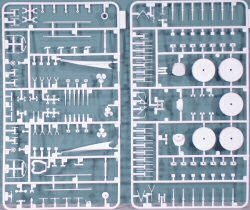 Markings are provided for the generic König class as evidently the König did not have any distinctive markings save some combat aerial recognition markings. Straight out of the box, this kit will build up into a beautiful model of this tough warship. 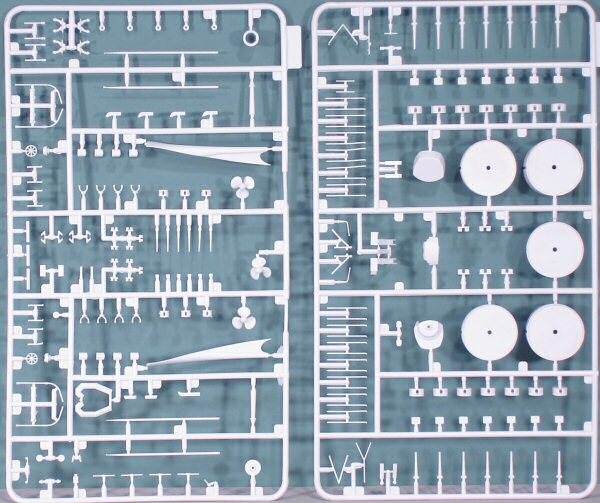 If you're experienced with photo-etched parts, this could easily be a contest winner with the addition of a photo-etch detail set from any one of several naval aftermarket companies. 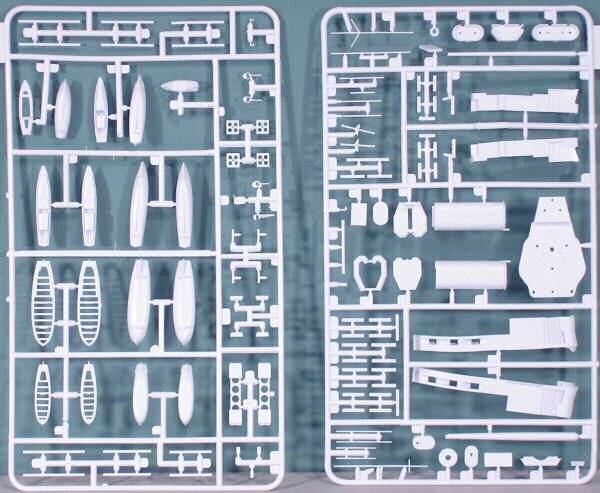 If you're a ship modeler looking for a unique subject to add to you're 1/350 collection, one of these König class battleships is just what you're looking for. If you have other modeling interests and you want something different to try your hand on, this is also an interesting segway into naval modeling.